For over 70 years, NYU's Graduate Tax Program has produced the best and the brightest tax practitioners, academics and government leaders, nationally and internationally. 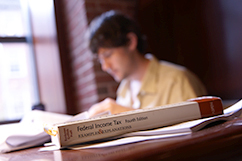 The NYU Graduate Tax Program is widely viewed as the preeminent program of its kind. Our consistently strong Tax LLM employment results confirm that employers—whether law firms, accounting firms or government agencies—view the NYU Graduate Tax Program as an important source of future tax lawyers. For detailed employment data, please visit our career services FAQ for Tax LLM students. Our tax faculty takes pride in learning from and with our students. We are fortunate that our location in New York City gives us access to the nation’s leading tax practitioners, many of whom teach evening courses. We also offer an online Executive LLM in Taxation program for attorneys and an online MSL in Taxation program for experienced CPAs and economists. These programs allow tax professionals around the world to access our course offerings online. We look forward to welcoming you into the NYU School of Law Graduate Tax Program community and advancing our stellar history even further.